New satellite imagery shows what appears to be improvements to the Yeongjeo-dong missile base, a facility located in North Korea’s mountainous interior, as well as work on a new facility, Hoejung-ri, 11 kilometers (seven miles) away. The researchers said given the work that has been done and the site’s location, the bases could be in line to receive North Korea’s newest long-range missiles, some of which are capable of carrying nuclear warheads and of reaching the United States. "Whatever [North Korean leader Kim Jong Un] says about his desire for denuclearization, North Korea continues to produce and deploy nuclear armed missiles," the Middlebury Institute’s Jeffrey Lewis told CNN. 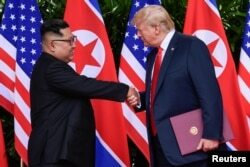 U.S. President Donald Trump and North Korea's leader Kim Jong Un shake hands during the signing of a document after their summit at the Capella Hotel on Sentosa island in Singapore, June 12, 2018. Following the recent G-20 meeting in Argentina, South Korean Moon Jae-in told reporters that Trump has “very favorable” views toward Kim and that he “likes him." “[Trump] asked me to tell Chairman Kim that he wants to implement the rest of their agreement together and he will fulfill Chairman Kim's wishes," Moon added. But despite the meetings and ongoing talks, many in Washington remain skeptical of the North Korea’s seriousness. "We're certainly in a better place than we were in 2017 because of the dialogue we've established between our two leaders, the president and Kim Jong Un," CIA Director Gina Haspel told an audience at the University of Louisville this past September, but noted getting a deal done would be a difficult sell. "The regime has spent decades building their nuclear weapons program," she said. "The North Koreans view their capability as leverage and I don't think that they want to give it up easily." U.S. Director of National Intelligence Dan Coats has likewise questioned Pyongyang’s commitment to denuclearize. “I put commitment in parentheses,” he told an intelligence and security conference this past September. "Absent mechanisms for the on-the-ground verification by inspectors, we cannot confirm that North Korea has taken any other denuclearization steps at this time,” he said.